Both Avalanche goalies pitched a shutout tonight. The Avs wish that didn’t have to be the case. 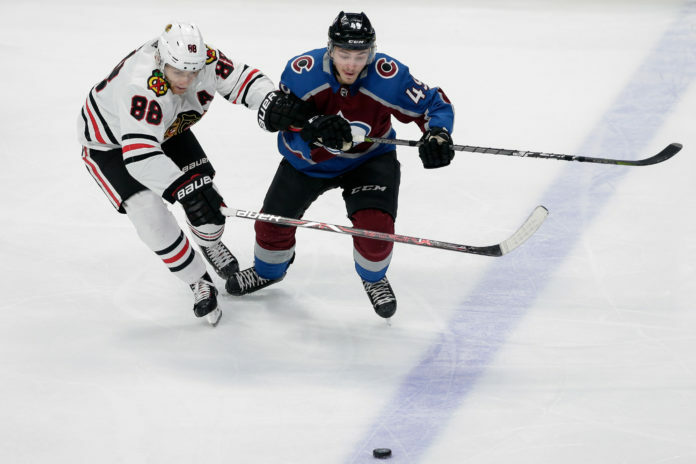 The power play and secondary scoring woke up for the Avalanche en route to a 5-0 victory over the Chicago Blackhawks. Semyon Varlamov continued his dominance over the Blackhawks, posting 30 saves on the night. Varlamov, however, would be forced to leave the game in the third period after being banged into after making a save. The news would put a damper on what was an otherwise great night for the team. Varlamov played a big role in the Avs even being in the game in the first period. Chicago came out with fire, putting heavy pressure on the Avs from the drop of the puck. 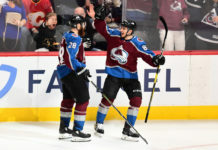 The Avs goaltender was on top of his game, and got a little help from Nathan MacKinnon, who stopped a puck from entering an empty net at one point. The Avs didn’t pick up the pace until late in the period, when they would get a power pay in the final five minutes. 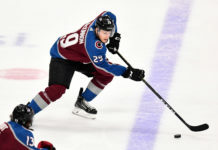 Sven Andrighetto, returning from a short absence, would do all the work, weaving through the Blackhawks defense and beating starting goaltender Collin Delia glove side to give the Avs the lead heading into the intermission. 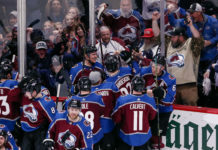 The Avalanche would carry the momentum of the late goal into the second period, as they controlled the majority of the play. About halfway through the period, the Avs would get another power play, and this time the top unit would go to work. After keeping puck in the zone for over 40 seconds, Mikko Rantanen would find Tyson Barrie at the point, and Barrie’s one timer would squeak through Delia to give the Avs a two goal lead. They would come close to extending their lead, but would carry that two goal lead into the third. In the third period, the Avs would take advantage of a tired Blackhawks team. Mikko Rantanen would bury a one timer a little over 6 minutes into the period on the power play to extend the lead to three, and not long after, a terrific passing play would end up with Tyson Jost ending his scoring slump and the route was on. Andrighetto would add a late marker and the Avs would blow Chicago out of the Pepsi Center for the second time this season. The Avs now head on a crucial west coast trip, where they will face all the teams they are currently battling with for a playoff spot. The hope is that they will have Semyon Varlamov available on this trip, but Bednar would have no update after the game on his status. On Sunday night they will face off against the Anaheim Ducks, in what is clearly their most important game of the year. Andrighetto’s return and scoring burst could be huge for this team down the stretch, who is in desperate need of a boost from their bottom 3 lines. The Avs played without Erik Johnson, who was a surprise late scratch. He went awkwardly into the boards in the last game and was too sore to play this evening. Luckily for the Avalanche, Jonathan Bernier is healthy and able to step in down the stretch if Varlamov is forced to miss any time. He came in after Varlamov left and made three saves. The injury to Johnson forced Samuel Girard into the top four on defense, and he excelled with the added responsibility. He played easily his best game in a few weeks. Nikita Zadorov finished the game with 7 hits, and now leads the league with 264. The next closest player has 248.